An all-expense paid, red carpet trip to San Francisco for GDC 2013. Submit your game. All are welcome to enter now. Deadline for submissions is Feb 24. Join a game jam. We’re kicking things off with simultaneous game jams in New York and London this weekend, with more events coming soon. Host your own jam. Our handy event kits make it easy. Learn more. About the competition rules, prizes and judges. Stay in touch. Follow us on Twitter and the Game On blog. 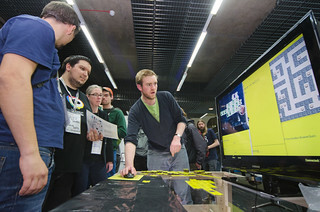 Or join the conversation through our mailing list or on irc.mozilla.org #mozgames.